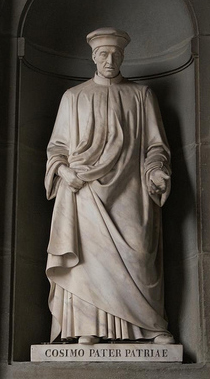 On this day in 1389 Cosimo de Medici was born. It’s not too often that history turns a page as swiftly as it did with the advent of the Florentine Renaissance in the early fifteenth century. It’s rarer still that the hand that turns the page is so visible–but that is the case with Cosimo de Medici. Born into wealth and power, Cosimo shrewdly wielded both to create a tremendous familial dynasty. Architecture was one of the signs of his magnanimity, and as a Humanist he steered architectural projects toward the modern celebration of values from the Golden Age of antiquity. In Filippo Brunelleschi he found the architect who could manifest Humanist ideals in buildings, realizing a new approach to building that also modernized Florence and gave physical form to its unassailable preeminence. Together they built San Lorenzo (1419) and the “Old” Sacristy (1421): the primary monuments that conjoined Classical (Florentine) precedent, clear geometry and exacting proportion into a wholly new architecture. Cosimo (d. 1464) understood the communicative power of architecture and directed Brunelleschi’s genius toward these symbols of the church. For his own house, however, he hired a second-tier architect to design a much less impressive structure. Not that the Palazzo Medici is a dump, it’s simply not in the stratosphere of San Lorenzo. And rightly so: Cosimo was nearly imprisoned, and briefly exiled, by his enemies who (rightly) feared his power. Knowing that “envy is a flower one must not water,” his own house intentionally failed to live up to the brilliance of the public buildings. 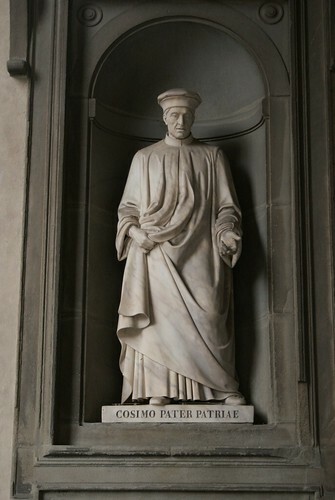 Not only as a patron of great vision and taste, Cosimo thus proved his mettle as a discerning leader, worthy of the title Pater Patriae, as well as Pater Architectura. You are currently reading September 27: Pater Architectura at Clio’s Calendar: Daily Musings on Architectural History.